When one has an immaculate journey to the inn at the last home, it is essential to try Oz's (Otik's) World Famous Spicy Potatoes. The best way to cleanse your pallet is a dry hopped red ale from Rogue. Three good friends from This Dust Was Once the Man and their fellow journeyman & guest judge, Jason, sat down to tackle such a feat in a low lit basement. The brew starts out like a typical red ale and continues this to middle. However, unlike most red ales, the hops begin to take over and leaves a distinct bitterness as the beer finishes. Essentially, red ales are associated with their lingering aftertaste, the St. 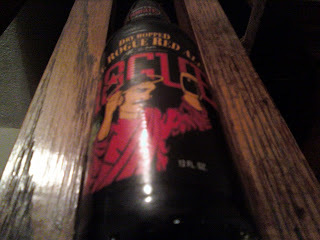 Rogue Red Ale accentuates the epic plateau of the latter half setting you up for a rather atypical coastic finish. Even though Moses composed Genesis 2000 years before any known written language, it's obvious Rogue has produced a better crimson product, namely this ale. We crossed the red sea, but in beer form.